Getting outside with your kids provides some quality time for family to walk, hike, or bike through a nearby park. 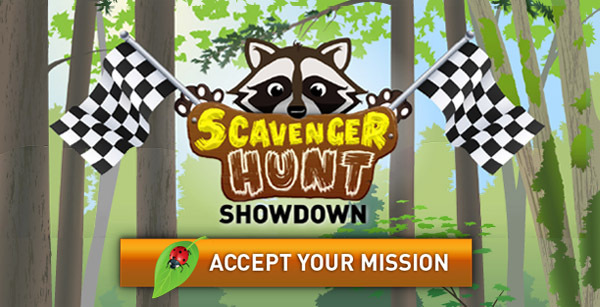 But the great outdoors is also an awesome place to burn off summer-time energy with some fierce competition – in short, it’s the perfect spot for your kids to get started on our newest summer Mission: Scavenger Hunt Showdown. With school out and long summer days ahead, we’re sending a shout out to all scavenger hunting pros, nature lovers, and explorers. It’s time to team up with a friend, neighbour, or family member and go head-to-head against some of Earth Rangers’ most memorable Mission characters for an awesome scavenger hunt. When your kids accept the Mission, they’ll get an official Scavenger Hunt Showdown Checklist, filled with all sorts of things they can search for. See if they can find the tallest tree around, or maybe locate the footprint from a squirrel or bird? There’s bound to be something orange out there that they’ve never seen before, or a leaf that’s been nibbled on by a bug? Encourage them to take a ton of pictures, especially shots of the amazing things you find together. Try to find as many items on the list as you can and see if you have what it takes to beat Captain Conservation and Elliot Eagle, Bobby Beaver and Sam Shoreline, and the rest of the Scavenger Hunt Showdown teams. Looking for a park near you? There are tons to choose from- in fact Canada is home to over 1,000 Provincial Parks and 47 National Parks. Try to find as many of the things on the Scavenger Hunt Checklist as possible, taking lots of pictures the adventure. Add up their team’s score to see if they have enough points to become the Ultimate Scavenger Hunt Champion! When they’re finished, they need to report back to the Scavenger Hunt Showdown page to let us know how they did, and send us a picture with the coolest thing they found. Do you have what it takes to defeat all the teams and become the Ultimate Scavenger Hunt Champion?